You may have assumed The Killing was destined for early termination ever since its first season finale (a.k.a., “Who killed Rosie Larsen? Tune in next year to find out!”) so gracelessly pulled the rug out from underneath us. But with its second season now wrapped up — yep, they did reveal the mystery this time; I won’t give it away here, in case you’re not all caught up with your hate-watching for the week [Editor’s note: for a more in-depth, spoilery look at the final episode, check out Andy Greenwald’s excellent postmortem here] — AMC is now considering a third season, which would feature main cops Joel Kinnaman and Mireille Enos working a new homicide. No, not because the ratings were good enough to shut up all that critical bashing — but because Kinnaman, who plays hoodie-loving Detective Holder, might become a big movie star soon. Since its April 2011 debut, ratings for “The Killing” have been trending down. The series opened with 2.7 million viewers before falling to 2.2 million for the season-one finale. Season two debuted to 1.8 million following the critical firestorm and ended at just under 1.5 million. Those numbers are well below both the recent 2.6 million season average of “Mad Men” and the 2.8 million that first-year Western “Hell on Wheels” drew for its season-one finale. Swedish native Kinnaman … has breakout potential and could be a drawing card for AMC as his movie career blossoms. His pic “Easy Money,” for which he won the Swedish equivalent of a best actor Oscar, is set to debut in the States in July, and he stars in sci-fi reboot “RoboCop,” a 2013 feature entry … Both Kinnaman and Enos, according to sources, have holding deals with AMC that extend through the latter months of the year, so the cabler may be in no hurry to make a decision on the show’s fate. I’d contend there are two flaws with this reasoning. First, while RoboCop will be a splashy, well-advertised production, won’t the fact that Kinnaman will have his face covered by a helmet for most of the movie limit his breakout potential? Second, say Kinnaman does blow up — would all his new fans really be drawn to The Killing? (“Hey, you know that guy you like now? Well, he’s on this show that you’ve heard everyone complain about. Check it out!”) In comparison, Zach Galifianakis is a big deal, but he couldn’t help Bored to Death stay on the air. That said, The Killing‘s left behind a bitter taste, and you can imagine why the proud, proven AMC would want to try and salvage the situation. 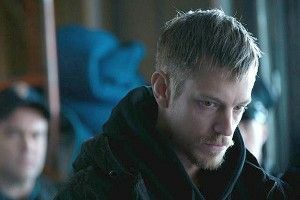 So here’s a counterargument: Let’s not forget that before the twists grew more and more fruitless, the first season of The Killing felt pretty promising, and a big part of that promise was the irrepressible clean-cut-Swedish-guy-playing-American-ex-junkie/implied-hip-hop-fan charm of Joel Kinnaman. Also, the concept of the show — a procedural episode stretched out over a whole season — is still sound. As Variety points out, “The Danish version, ‘Forbrydelsen’ — which received rave reviews during its run in 2007 — “on which ‘The Killing’ is based, is currently in production, so if AMC execs want to mimic the fortunes of that skein, the template has been set.” So say AMC does wipe the slate clean for a whole new murder investigation, maybe dumps divisive showrunner Veena “Holistic Journey” Sud in favor of someone willing to try and fix the show’s visible flaws, and brings back Kinnaman, who, let’s say, has in the meantime blossomed into an A-list star who just shreds through endearing late-night talk-show appearances — now, is that something you might be willing to gamble on?